It was all kind of north African in style, and I found myself wanting to give it a filmic title – I guess this stems from a holiday I had in Tunisia a number of years ago, where we signed up for a couple of days in the desert, away from the resort (Port el Kantouai – scene of the recent terrorist attacks). We headed up through the Atlas Mountains in a couple of Land Rovers, and the vista was stunning – I’d never seen ‘desert’ before, and hadn’t expected it to be so beautiful – mountains and valleys and salt plains sparkling like vast lakes. Apparently the Atlas Mountains (follow this link for some fabulous photos, not my own alas!) have been used for the shooting of a number of films – Star Wars, and The English Patient are the ones that come to mind now – and you can see why. I’ve never actually seen Casablanca so I may be completely out of kilter here, but ‘Play it, Sam’ seemed like a good name for my menu. Part of our trip involved a couscous meal with lamb. It was good, tasty and filling and quite simple although with subtle aromatic spicing. 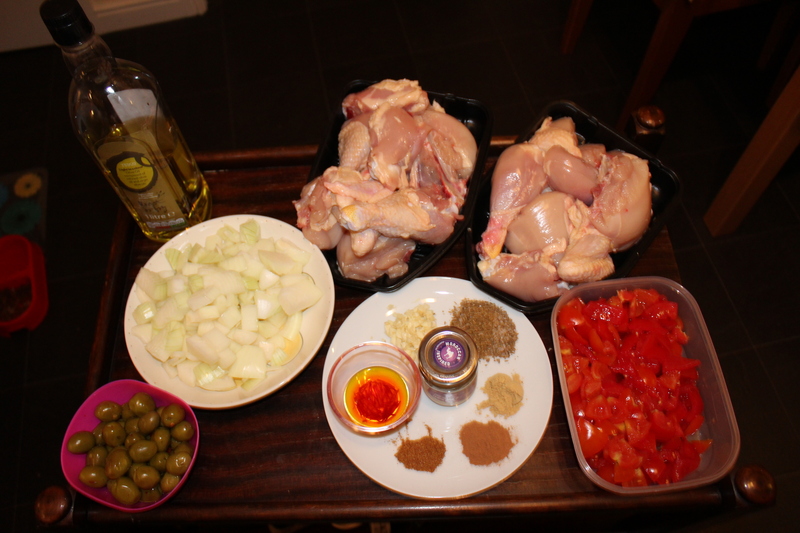 The photos show my ‘mise en place’ for the chicken dish, with its palette of spices. 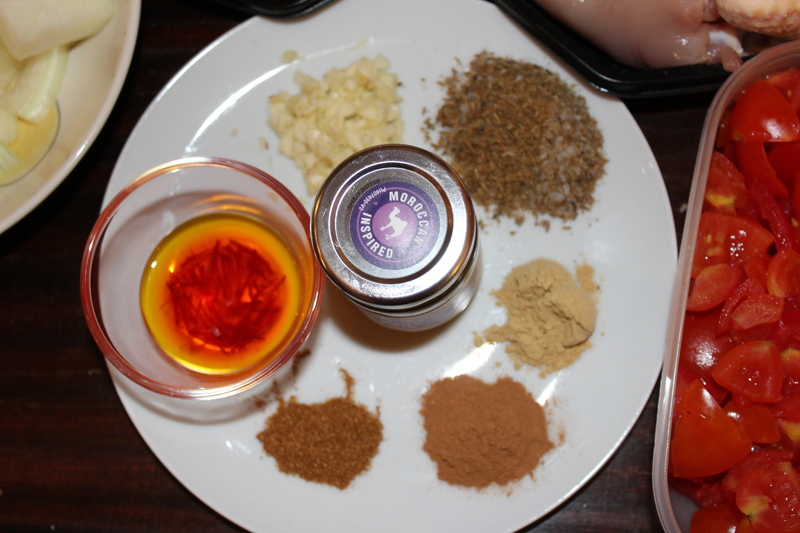 I used a couple of ingredients I hadn’t used before – preserved lemons, and harissa paste. The lemons are, well lemony and also salty, and bring a real fragrant bitterness to the mix. The harissa paste is smoky and warm. Both the veggie and meat recipes use saffron, and I dutifully shelled out the necessary small fortune for same. But you know what? I don’t really get saffron. Maybe my palate isn’t sophisticated enough, but alongside all those other strong flavours, I just can’t find the wonderful difference that saffron is supposed to make. Sorry, Hugh F-W, but I think I’m going to drop it. It’s been a dull summer in Scotland – not much sunshine, lots of rain, sometimes even a bit cold. But I have pledged never to moan about Scottish weather (‘moderate but changeable’ according to Visit Scotland – now there’s a euphemism!) after my stint in Zanzibar. Dull/cool/wet are easier to cope with than hot, steamy, mosquito-ridden. And somehow or other, despite the drabness of it all, things are still growing in people’s gardens. Here are pictures of two gifts that have come my way recently. This first is an armful of sage from my friend Margaret’s back door – it grows wantonly and she never uses it in cooking, so it was about to be dug out and dumped. I am drying it on a contraption normally used for drying my knickers … ideal, actually. Sage dries well and I use it through the winter in lots of things, especially Italian-based recipes. The second photo was taken last weekend. After church I was invited to go to the home of a lady I’d only just met, and help myself to her redcurrant harvest. I’m glad I did – it was absolutely rampant. I put the fruit in the freezer when I got home and will make jelly as soon as I remember to buy a large sieve. Tomorrow, hopefully. 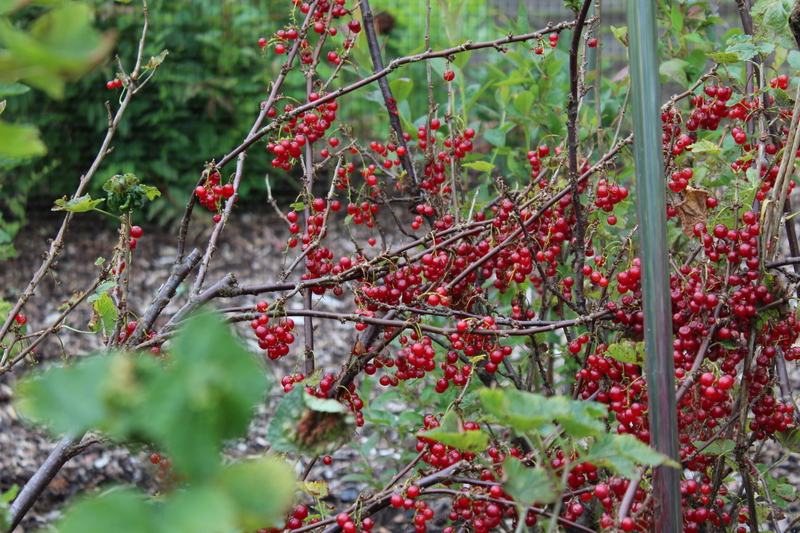 Redcurrants have a lovely tart, fresh flavour and their jelly is gorgeous either on scones or with a nice piece of lamb. I’m wondering whether there’s a redcurrant version of Creme de Cassis – has anyone come across such a thing? A Kir, Royale ou normale, is a wonderful thing. I could invent a nice Scottish aperitif – although as with most of my brilliant ideas, somebody probably already has. 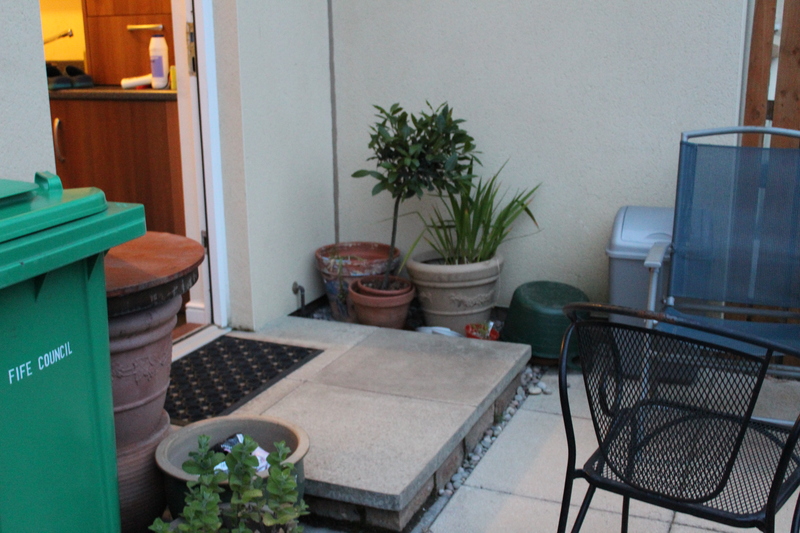 And finally, here’s a picture of my own back door, with its neatly-edged path courtesy of Mary the Mower. I lashed out £15 recently at Aldi’s to buy the bay tree – a great bargain, I believe – and so far I haven’t managed to kill it. This morning, not before time, I transferred it into a much bigger pot so it’s looking a bit more comfortable. Every time I spend 70p at Tesco on a toty wee packet of bay leaves that are dull and dry and last no time at all, I tell myself I must buy a bay tree. And now I have. So if my arithmetic’s correct, I’ll be in pocket after 21 harvests … that’s a hell of a lot of bay leaves. Maybe it wasn’t such a bargain after all. But it does look nice.